Color is an integral part of our lives. We use color in everything from the clothes that we wear to the way we decorate our living and work spaces. Have you ever thought about how color affects you? There are many ways to use color to enhance the way you live through décor, food and clothing. Do you know the color that should never be used in a bathroom? Which color added to your diet will help you when you’re feeling out of balance? Should you wear red or blue to a specific social gathering? 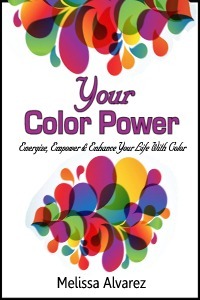 Your Color Power is a simple guide that will teach you how to use color to your advantage while enriching your life. You can use it to relieve stress, create beautiful spaces around you and to balance yourself on a spiritual level. This easy useful guide will help make color work for you.